What was your first impression of NEC? The first month I was here as a freshman, I wrote an article for The Penguin about the community. I was from California, 3000 miles away, and I was surprised how everyone here got along so well. There were none of the typical stereotypes you hear about conservatories. At a fundamental level, everyone at NEC understands that we’re all musicians working to achieve the same goal, just through different outlets. I started playing music when I was 8. I took guitar but that didn’t stick, so I tried piano and trumpet but when I started the drums, that was it for me. I still remember my first concert, standing on stage I knew that’s what I wanted to do. I did youth orchestra, All State, All Southern, and BUTI, where I got to work with BSO members who ultimately led me to NEC. What is the best thing about life as a percussion major? I think the versatility in what we do. If I get bored playing the snare, I have 10 other instruments I can practice. I also have the option to play all different styles, so I’ve made it a real goal to learn as many different types of drumming as I can, so I can go to a jam session and just be able to jump right in. James Klein was my advisor for my liberal arts minor. He is outstandingly brilliant, unbelievably quirky, and thoroughly awe-inspiring. So, I attached myself to him and he never stopped being a source of inspiration. The faculty, which I think is the most important thing when choosing any school. 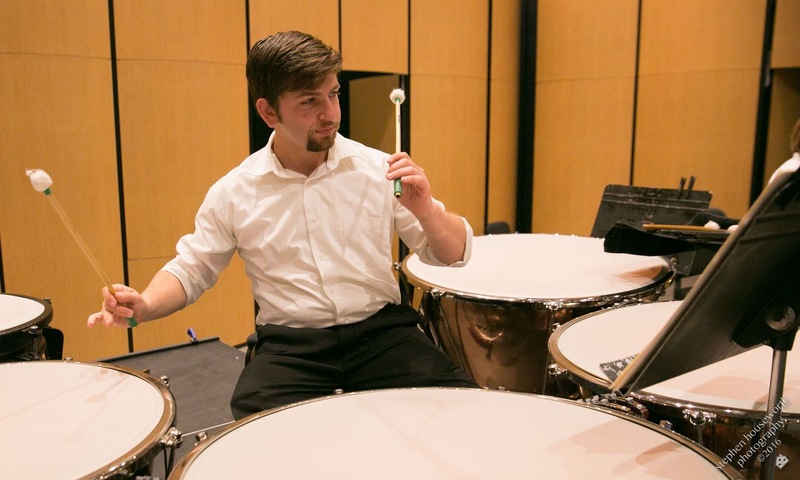 NEC was also the only school with a percussion program that had the entire department faculty working in major symphonies at the time. No other school could make that claim. One time, Dan Bauch, a member of the BSO and teacher at NEC, told me he viewed me as a colleague, not just a student, because ultimately we’re all going to be working together one day. I think every musician goes through the phase of wondering “Am I good enough? Can I do this?” but I had such a supportive crew between the entire faculty and also my colleagues. They could all give me their wisdom and tell me how they dealt with the same thing and that helped me work past that feeling. I enjoyed NEC as much as I did because I tried to do as many things as I could. There are so many opportunities to get involved. I think it’s important to get away from the idea that you have to practice all day. I taught, I worked at Prep, and I still practice 5 or 6 hours a day, but I also do other things. Everyone at NEC understands that we’re all musicians working to achieve the same goal, just through different outlets.